Windows 10 comes with an updated version of Internet Explorer that includes a new rendering engine, and in Build 9879, we can switch between the old and new rendering engines. Brad Sams from Neowin notes that, according to his sources, Internet Explorer in Windows 10 will ship with two different engines. One will be the engine from IE11 and will have legacy components to allow older websites to work and the other will be an updated engine that is more lightweight and modern. Sams explains that website in compatibility mode will use the older engine while everything else will use the newer engine. Microsoft calls the new engine “Edge Mode”, while the old engine is called “Document mode”. According to Microsoft, the Document Mode is deprecated as of IE11. In Windows Technical Preview build 9879, we can switch between the legacy and modern engines. To enable or disable the new engine, open Internet Explorer and type in “about:flags” without the quotes in the address bar. 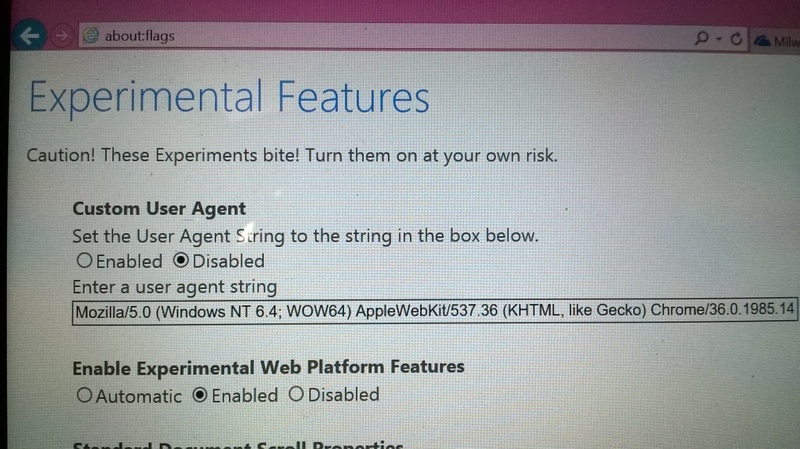 You should see the “Experimental Features” page. Notice the heading that says “Enable Experimental Web Platform Features” under which are options that say “Automatic”, “Enabled”, and “Disabled”. To use the new engine, select “Enabled”. “Automatic” allows Microsoft to decide which engine you get. If you are interested in learning more about this and about the new features included in the newer engine, I highly recommend reading this article by Petri IT Knowledgebase.